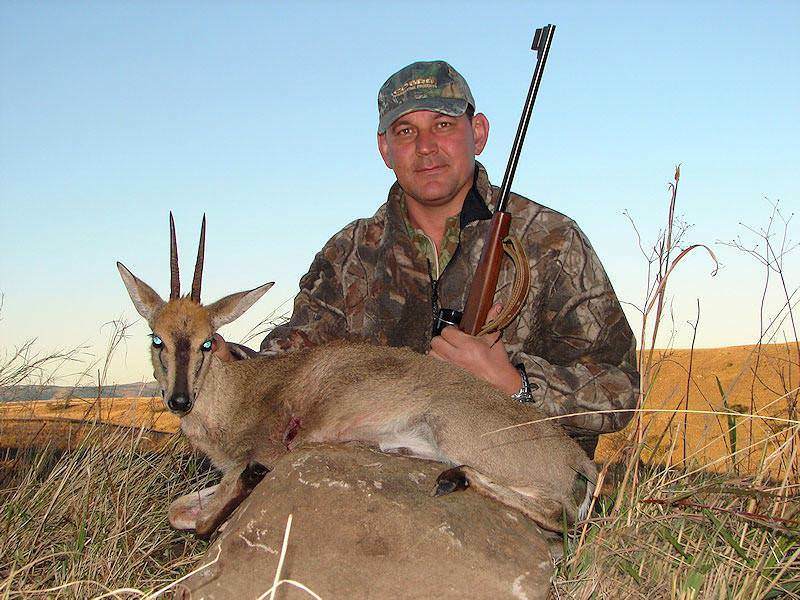 The little grey duiker can be hunted in almost all of the safari areas of South Africa. 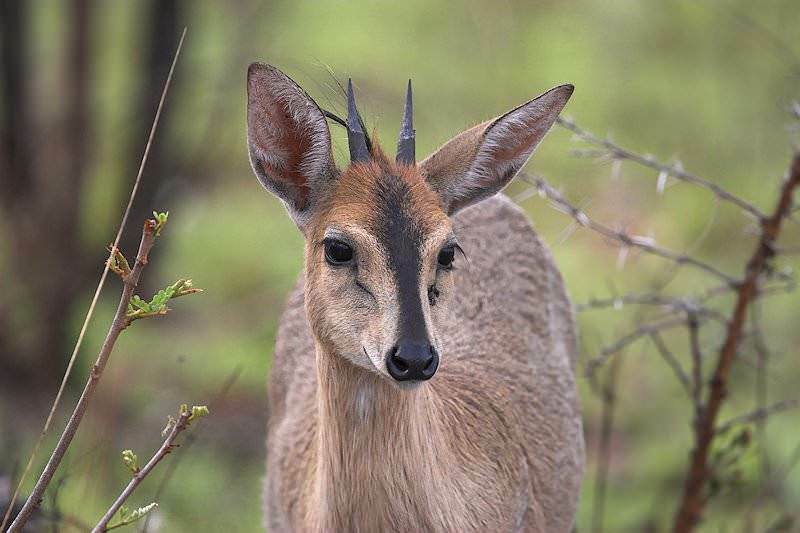 The grey duiker may be a medium-sized duiker, but he is still much smaller than most of the other antelope species. 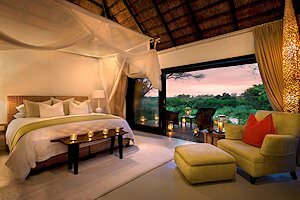 You can think of him as modified for life in the savanna woodlands. 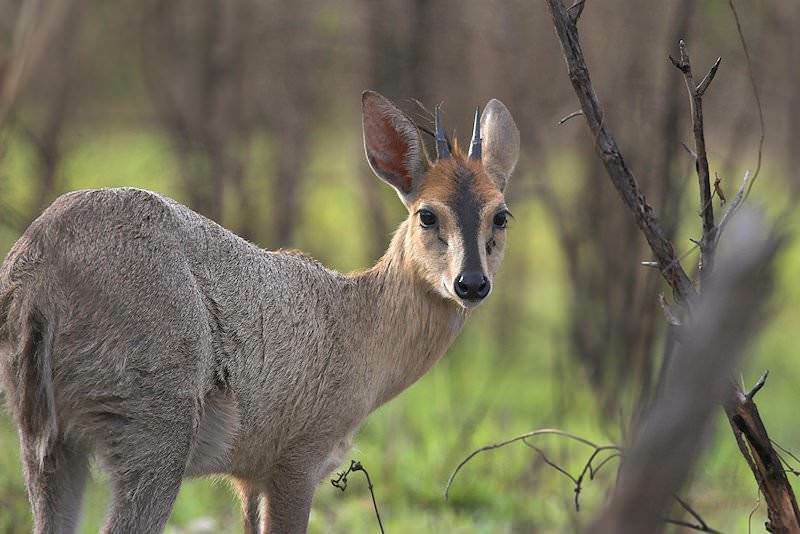 His legs are longer and better developed, while his back is less rounded than the forest duikers. 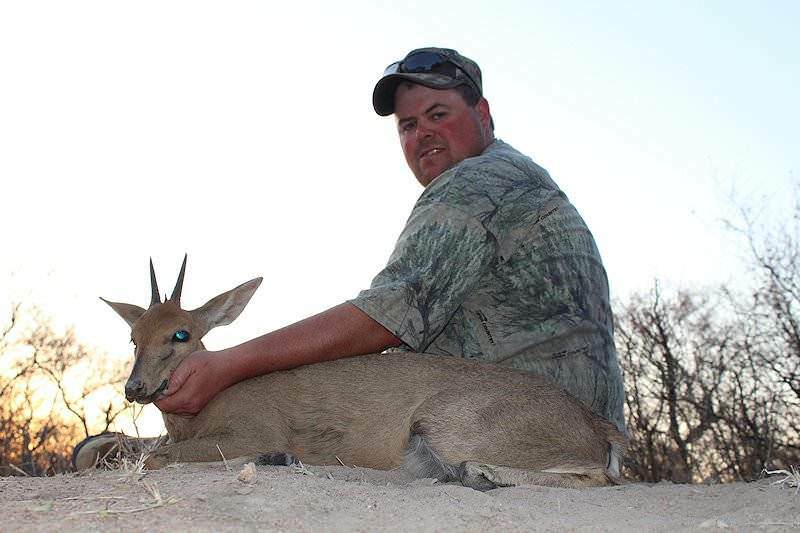 Unlike most of the other duikers, only the male carries horns, which stand fairly upright. The name 'duiker' is derived from the Dutch 'duik', meaning, 'to dive', descriptive of their low, scooting style of running. 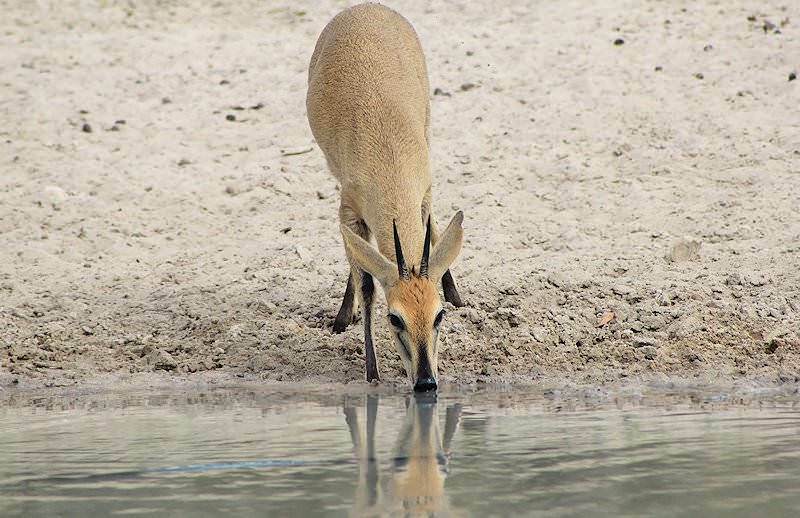 The duiker is mostly a browser, and most active during the late afternoon and early evening. 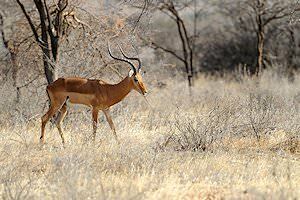 A solitary antelope, he will most often be encountered alone. 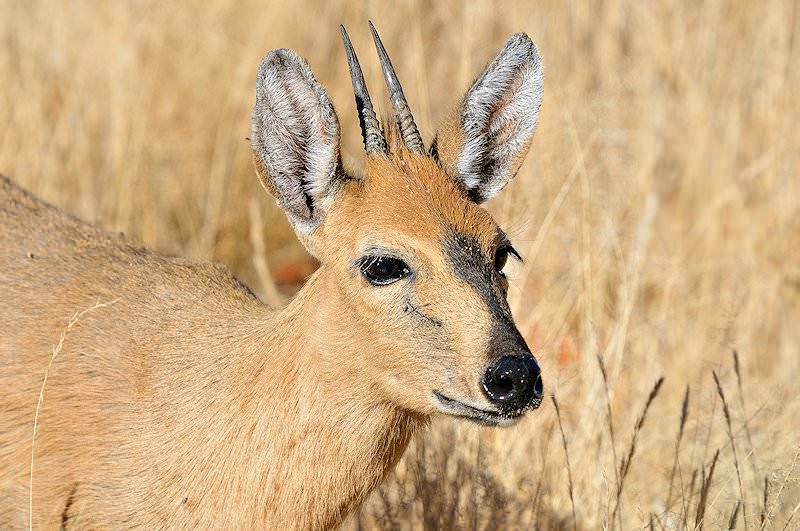 This member of the pygmy antelope clan can survive in close proximity to man. He is independent of water as he is able to get sufficient moisture from browsing. 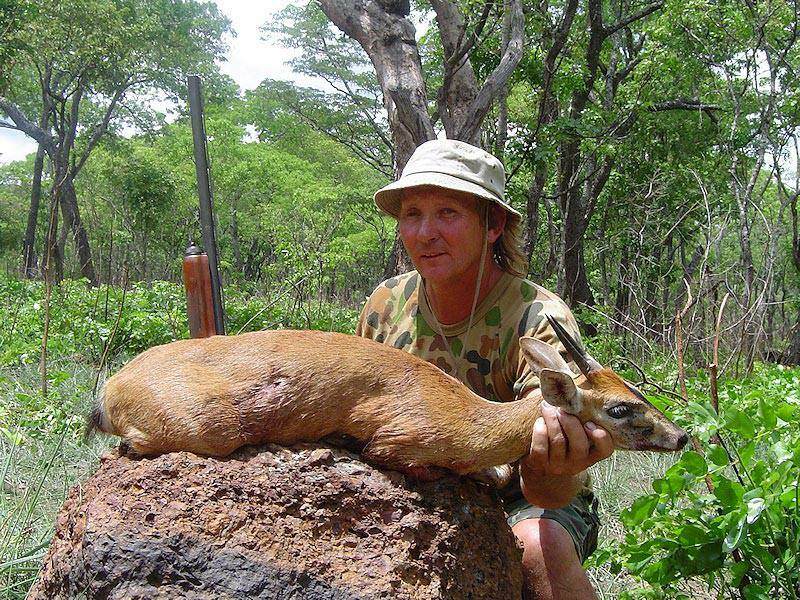 When hunting duiker, trophy evaluation can be difficult, as most often only fleeting glances will be offered. 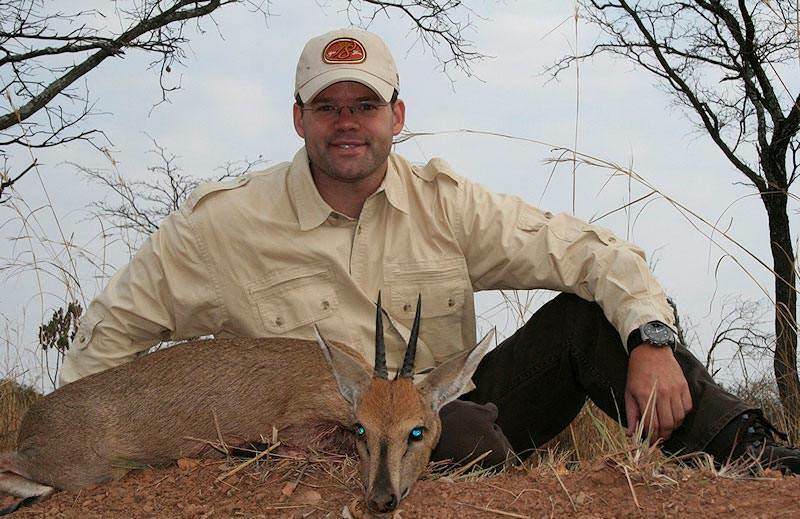 Horn tips level with the top of the ears are about 4 inches in length; if the horns extend beyond the ear tips by an inch or more, you are looking at a fairly high scoring trophy. 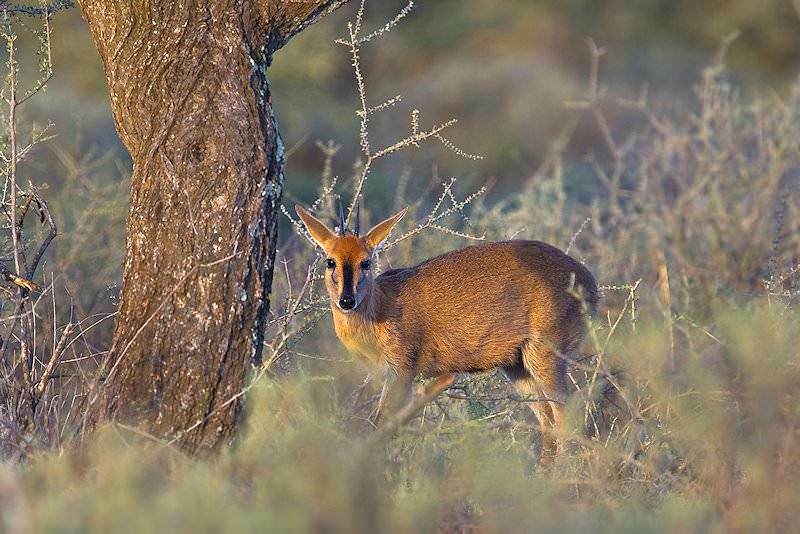 Hunting Duiker can be extremely difficult; this mini-antelope has extremely refined senses, small size, camouflaged coloring, and a habit of staying in or close to the long grass and thick brush. 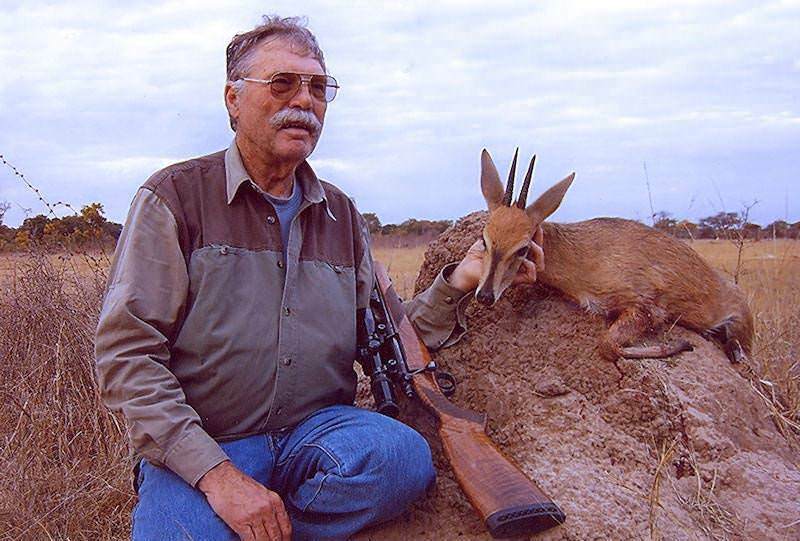 Just about all the hunting calibers, from the .223 to the .375, are used to take the duiker. 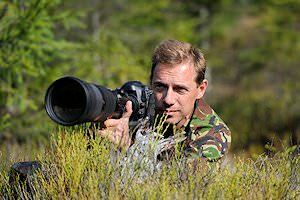 Often a target of opportunity encountered when hunting some other species, the rifle that happens to be in hand will become the rifle of choice. 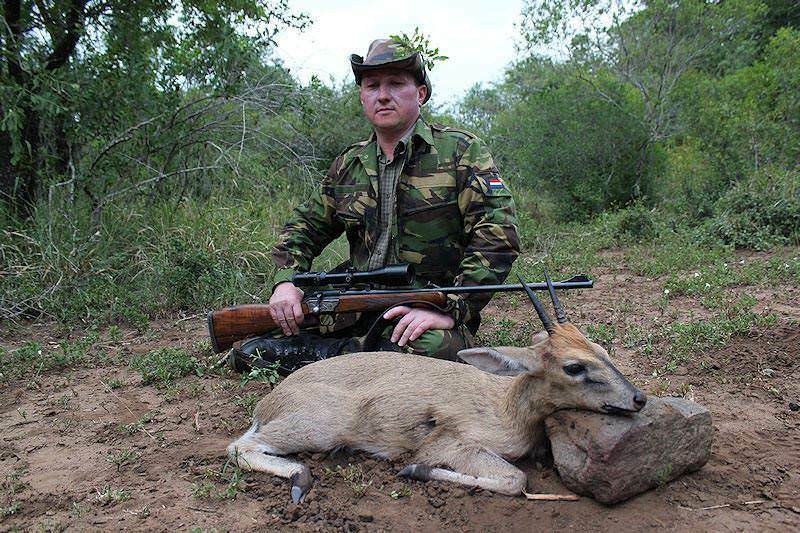 When hunting purposely duiker, a shotgun would be an excellent choice, as most shots will be taken at short range on a running target. 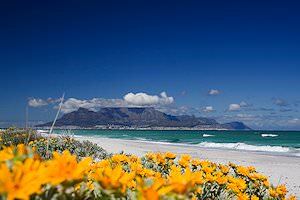 Place your shot on the side-on target to execute the high heart/lung shot; i.e. 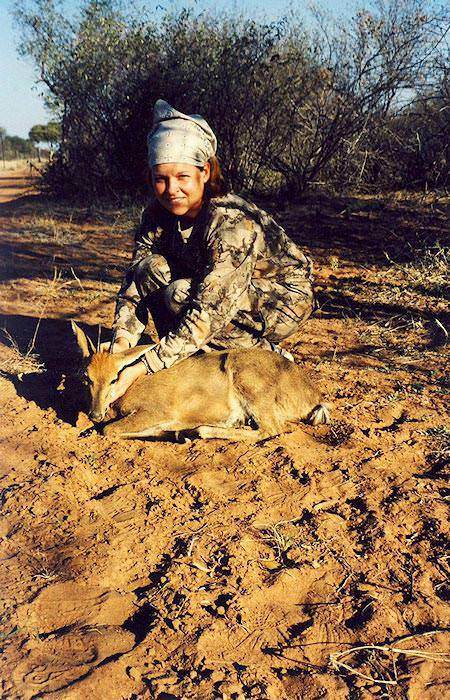 straight up the foreleg, just below the animal’s midline. 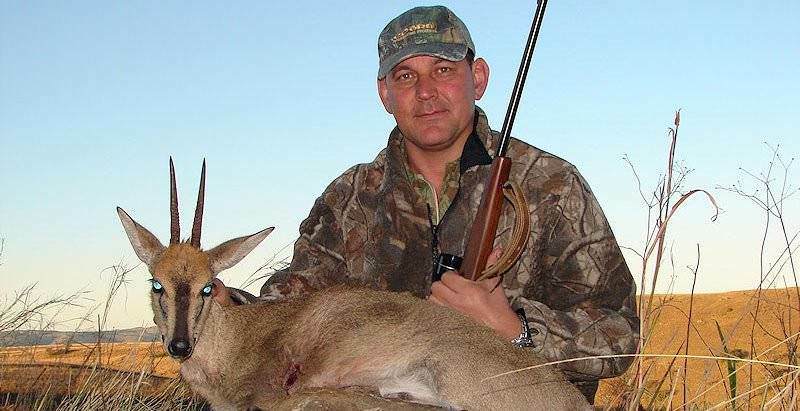 Quick expanding bullets placed high on the shoulder will result in a spinal hit and the little antelope should drop to the shot, making him a lot easier to find.